This page is about Wikipedia Books – books built from Wikipedia articles. You may be looking for Help:Books, WikiProject Wikipedia-Books, WikiProject Books, Wikipedia:Notability (books), Print Wikipedia, or Wikibooks. WARNING: There is no in-house Book rendering service any more. A new one is being developed. For the latest information, see here. You can still create and edit a book design using the Book Creator, and upload it to an external rendering service. Pedia Press offer final tidying and ordering of print-on-demand bound copies in (approximately) A5 format. PDF softcopies may also be built using the independent open source tool, MediaWiki2LaTeX, which may be used online or installed locally. Pedia Press are also developing the replacement PDF softcopy builder for Wikipedia. For help with downloading a single Wikipedia page as a PDF, see Help:Download as PDF. Some information in this page may relate to an earlier version, which has now been decommissioned. Status last updated 31 March 2019. A Wikipedia Book is an organized collection of Wikipedia articles that can be sent to a third party service for rendering electronically in PDF format, or ordering as a printed book. The book is compiled afresh each time it is retrieved by the service, so the a new upload will always reflect the latest versions of the articles. Each book has its own Wikipedia page, which contains a Contents list of the articles included in it together with formatting metadata such as Chapter headings. You can create a book as a sub-page in your own user space, or as a community book in the Book: namespace. The Book Creator tool automates much of the book design work, although experienced editors can still code up the book design by hand. 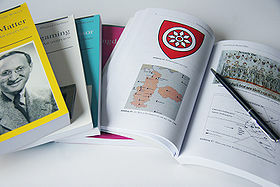 Once completed, a book can be uploaded to the independent company PediaPress, where print-on-demand copies can be ordered. Books may also be retrieved by other independent publishing tools such as MediaWiki2LaTeX. It used to be possible to build an e-book on Wikipedia for immediate download, but this service is no longer available. For information and help on Wikipedia books in general, see Help:Books (general tips) and WikiProject Wikipedia-Books (questions and assistance). You can look for books either by browsing the book categories or by searching for a title or topic. Wikipedia books are automatically categorised by location. Category:Wikipedia books (user books) lists all current user books maintained on user pages. creates a search box which will return a list of book titles. The Bookshelf is a simple tool which combines the above options with a few statistics, enabling you to browse, search and view the Wikipedia Books created to date. You can place a copy anywhere by clicking the Edit tab above and copy-pasting the code from this page. Featured topics and Good topics are collections of some of Wikipedia's best articles. Some topics may have a dedicated book linked in the upper-left corners of the topic boxes. The Book Creator user interface, for designing the book and for selecting an electronic format to render an individual copy as an e-book. The Wp:Offline Content Generator (OCG) back-end service, which rendered the book in the chosen format and made it available for download. But Wikipedia does not print books or handle ordering, as that costs money. An agreement was reached with PediaPress, who built their own renderer and publishing website, where a user could upload a Wikipedia book and order Print on demand copies. Eventually the OCG service became outdated and unmaintainable and was switched off in 2017. Since then, Wikipedia books have only been available from third-party providers such as PediaPress. A candidate replacement, called Electron, was based on the open-source Chrome HTML-to-PDF rendering engine but proved unsuitable for books, although it replaced the OCG for the PDF download of single articles. A second attempt, named Proton, also failed. In April 2018 PediaPress stepped forward to try and develop a viable replacement called Collector, based on their previous experience with their own in-house renderer. The new renderer is planned to provide limited initial functionality, with incremental improvements over time. It is being developed as a closed source project. As of April 2019 the Book Creator design tool and PediaPress print service remain available. However an alpha release of the core Collector service has yet to become usable.